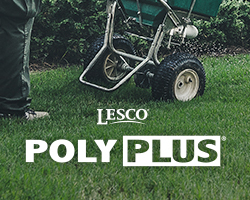 LESCO® PolyPlus Extended Release and PolyPlus Season Long fertilizers are helping landscape professionals promote a healthier greening response, use less labor and build a more successful business. Nitrogen is one of the key building blocks of plant nutrition. But this valuable nutrient is often overused—or not used to its full potential—in traditional fertilizers. Through a controlled, metered release, LESCO® PolyPlus fertilizers maximize nitrogen’s benefits, delivering a host of advantages, starting with a healthier, longer-lasting green. Maximize root health and minimize thatch. Reduce nitrogen leaching and water usage. Lower equipment maintenance and fuel costs. Take on more customers while minimizing labor costs. Get more value out of every bag.